This paper explores how commons reproduce over time and introduces the concept of commoning to discuss rural continuities and change. The point of departure is that commons are essential for local community development in that they have an important role for mediating social change and for local identity production. Through an ethnographic and historical study of a number of commons systems from the village of Ängersjö in the Midwest of Sweden, the paper argues for a more historically and socially grounded understanding of how commons evolve. The paper examines Ängersjö’s commons within two broad historical time frames – the pre-industrial (4th to 20th century) and the post-industrial time periods (20th century to the present) – in order to understand commons, not just as arenas for resource extraction and resource struggles, but also as important contexts for identity formation, local mobilisation and for shaping rural change. The paper reveals how the commons have co-evolved with changes in society at large and how the meanings and functions of the commons have changed throughout history – from being important economic resources – to cultural and symbolic resources that have created new avenues for collective action. Traditional accounts of commons tend to focus on the trajectories of the commons in the context of various disputes over resources. For many, the central dynamic has been the classic conflict-cooperation dichotomy, which has led to attempts to explain under what conditions commons persist and evolve from adversarial relations of resource exploitation to more collaborative ones. Those working in this vein have mostly concentrated, following the title of Hardin’s classic contribution on the tragedy of the commons (1968) and Ostrom’s foundational work, on design principles and successful determinants of collective action (e.g. Ostrom 1990, 2000; Ostrom et al. 2002). Underpinning much of these literatures is a focus on institutional design and economic incentive structures of rational choice which suggest that commons evolve and persist when benefits from the resources are greater than the transactions costs of cooperative behaviour. Our interest in exploring the trajectories of the commons are related to the above accounts, but grounded in a perspective that seek to explore how institutions, resources and societies co-evolve contextually over time (c.f. Norgaard 1994; Steins and Edwards 1999; Cleaver 2002, 2012; Sandström 2008; Nightingale 2011). By conceptualizing and framing the commons as contextually grounded processes this article explores how one Swedish inland community – Ängersjö village – has shaped and maintained various types of commons over time in relation to social, political and historical trends of society at large. A focus on how commons reproduce over time may help to bring out an additional set of issues of how commons produce different localities and identities and their relationship to contemporary politics, economy and history. In such processes cultural symbols of commons are often brought into play in shaping the outcomes of the resource system and in the production of specific identities (c.f. Appadurai 1996; Mosse 1997). By using the concept commoning introduced by Linebaugh (2008) and later developed by Bollier and Helfrich (2015) we highlight commons as process that is constituted in the general reproduction of the community emphasising the blurred nature of the commons, as not only comprising a set of property relations vis-à-vis natural resources but also as associational practices around specific places and buildings that are managed collectively1 regardless of their juridical form. Seen from this perspective, commons are not only juridical and economic resources2 but also important social resources that bind people together in a place for a common purpose. In this way the concept of commons is close to the concept of community as the ongoing process of commoning and the common use of the commons can be seen as an important part of the symbolic construction of community (c.f. Cohen 1985; Fournier 2013). The commons can be seen as a socio-ecological adhesive that contributes to constitute communities. Conceptualizing commons in this way and by exploring how commons reproduce over time, in relation to broader societal changes, one can gain an understanding of not only resource dilemmas but also how specific places and identities are constructed. Hence, the concept of commoning infers a dynamic process integrating history, social interaction and environment. Such conceptualisations have important implications for how we comprehend the dynamics of the commons. It is not merely a question of explaining how resource use affects the commons, but rather about exploring how different commoning processes co-evolves and how they are embedded within the societies that use them (c.f. Nightingale 2011). In our study we will highlight the co-evolutionary nature of the commons in the village of Ängersjö from a perspective of longue durée (c.f. Braudel and Wallerstein 2009 ). In the first part we trace the early commons that existed in pre-industrial Ängersjö from the early Iron Age up until the main era of privatisation of common lands in the early 20th century through a review of archaeological and historical sources. We describe their multifunctional roles and reveal how the commons were dismantled during the era of land reforms when the forest gained an increased monetary value. In the second part we describe how the commons have outlasted earlier production systems and transformed from primarily economic resources (productive commons) to social (associational commons) and symbolic resources (symbolic commons) for the village. In the subsequent discussion we compare crucial features of the commons and discuss their developments drawing on a critical institutional perspective 3 of how commons evolve (Sandström 2008; Cleaver 2002, 2012; Cleaver and De Koning 2015). Consistent with Frances Cleaver’s observations [which in turn draw on the work of Douglas (1987)], we show how diverse forms of commons are shaped through processes of reinvention and bricolage, where analogies of ‘thought styles’ are drawn from existing institutions, historical narratives and wider authoritative discourses. Finally we conclude the study by discussing the central role of commons for understanding broader processes of change in which particular localities and identities are produced. Ängersjö village is situated in the mid-western part of Sweden in the county of Jämtland (see Figure 1). The environment is characterized by boreal forest covering a hilly topography interspersed with lakes, rivers, streams and mires. Similar to many other small villages in the interior of northern Sweden, Ängersjö has experienced outmigration, unemployment, and closed schools and shops over the last decades. In the 1930s the Ängersjö parish had about 400 inhabitants mainly active in forest related activities (Johansson 2002). Currently the village comprises 22 permanent residents and similar to many other rural places in this part of Sweden, many people reside elsewhere, but maintain links to the village by being part-time residents (Ekman 2006). About 55 people are part-time residents of which about 25 persons have kinship relations to the village and 30 are part-time residents without kinship relations. The village has an active village association as well as a number of other associations that relate to a variety of commons – some with long historical continuity – that are of importance for the village identity and, as we will outline below, for maintaining the village and for driving change. This paper draws on data from yearly fieldwork (2011–2014) using participant observation and informal conversations with the villagers. Questions concerned past and present commons and levels of cooperation in the village in relation to e.g. natural resource use, to community buildings and to associational life in general were examined. The study has been enriched by the records collected by Ekman, who has conducted extended ethnographic fieldwork in the village since 1995 (e.g. Ekman 2002, 2006, 2012, 2013). The repeated visits to the village has given us the possibility to follow social processes, providing the study with deep understandings of village continuities (c.f. Howell and Talle 2012) and people’s relationships to the commons. We have also examined newspapers, official protocols and local historical records in order to contextualise the data and situate the study in a wider frame of reference. 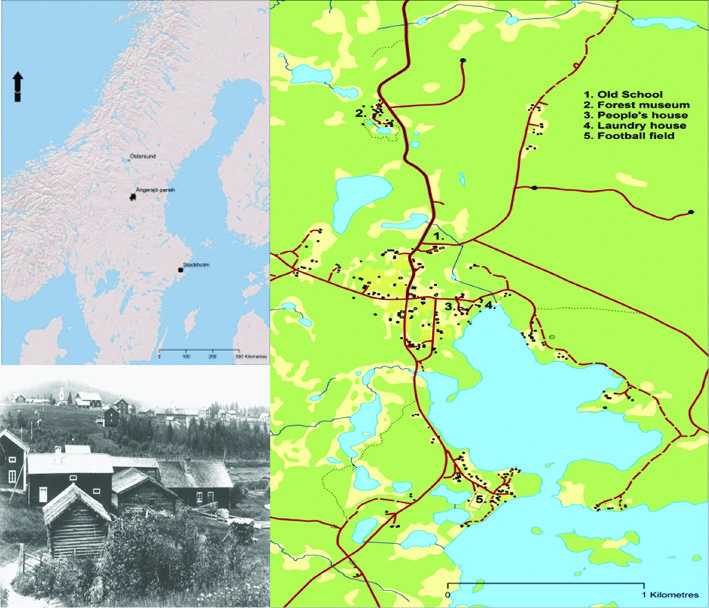 In addition, we have been able to draw on a previous multidisciplinary research project – the so called Ängersjö project4 – that has resulted in a rich ethnographic and historical record of the village extending over the two last millennia (e.g. Johansson 2002; Emanuelsson et al. 2008). Our analysis is also partly informed by a previous study in which we suggest a landscape approach for modelling prehistorical commons (Lindholm et al. 2013). Map left: Scandinavia with the parish of Ängersjö. Map right: Ängersjö village Picture bottom left: View of Ängersjö from the early 1900s. Several of the farm buildings in the picture are now gone and some of them have been turned into seasonal residents. Photo: Ängersjö village archive. Map data left © Esri and right © Lantmäteriet, i2012/901. In a previous study we have suggested that the earliest commons systems in the Ängersjö area can be associated with the introduction of the field-and-meadow system from the middle part of the Iron Age (300–500 AD) (Lindholm et al. 2013). The field-and meadow system was based on a landscape duality of in-field areas for cultivation of manured fields, and common outland areas with fall trap systems, tar and iron production, and livestock herding (Svensson 1998; Karlsson et al. 2010). The field-and-meadow system in the Ängersjö parish was based on institutionalised use of commons. Support for this notion is gained from a comparison between archaeological sites indicative of cooperative forms of land-use with the first written Swedish law in this region5 (Lindholm et al. 2013). The comparison suggests that the law formalised already established practices and legal customs around common resources (ibid; Brink 2013).6 The early settlements maintained farms and livestock herding but appear to have focused on hunting, specialised crafts and trade. Social and economic stress around AD 900–1000, seem to have resulted in a shift towards a land-use regime more prone to iron smelting and livestock herding (Lindholm and Ljungkvist 2016), similar to the historically described shieling system. A shieling is a periodic settlement associated with grazing commons. The shielings were usually located in areas where the grazing was less exploited than near the farm in order to increase pasture and land for haymaking and thus be able to feed more livestock over the winter. Generally the shielings were located on such distance from the main settlement that it was necessary to keep people at the place and to have facilities for both people and livestock (Nyman 1963). Ängersjö has several historically documented shielings, as well as archaeological dates associated with stone structures interpreted as milk cellars from ca. 1100 AD (Karlsson and Emanuelsson 2002). Karlsson et al. (2010) also suggest that another essential reason for establishing shielings was to demonstrate control and claim rights to the commons in the outland areas. The commons pastures associated with the shielings constituted an important resource in Ängersjö (see Figure 2) and covered vast forest areas that were used in combination with other forms of common resources use, such as iron making on the bog mires, game hunting, charcoal and tar production (Karlsson and Emanuelsson 2002; Lindholm et al. 2013). The iron, cheese and butter produced were often traded to more centrally located markets in Sweden and Norway (Johansson 2002). For both the field-and-meadow and the shieling systems, the commons thus seems to have constituted the engine of the economy during the pre-industrial era. They were embedded in a multifunctional and dynamic land-use system that involved labour intense collective land use practices, that was linked with inter-regional trade networks. The agricultural land (the infields) was thus limited and of secondary importance to the economy and survival in these areas during the pre-industrial era. The early pre-industrial commons were often organized in so-called lag (e.g. fäbodlag, byalag,7 jaktlag). The suffix –lag has a double meaning in Scandinavian languages, meaning both team and law, and its relationship to e.g. the prefix by- meaning village, suggests that it is the team of the village that creates and maintain the ‘law’ in the village. Generally the lag, comprised landowners who were entitled to a share in a village common through possession of a farm unit. Apart from managing commonly held natural resources and infrastructures, such as roads, mills, fences and dams, the byalag was also responsible for many other tasks in the village, such as the care for elders and orphans and for solving disputes. There does not seem to have existed a formally registered byalag in Ängersjö, but from archival documents (Ängersjö village archive), it is possible to deduce the existence of different forms of lag (teams) e.g. hunting- and shieling teams organised by the landowning farmers (Eliasson 2013). 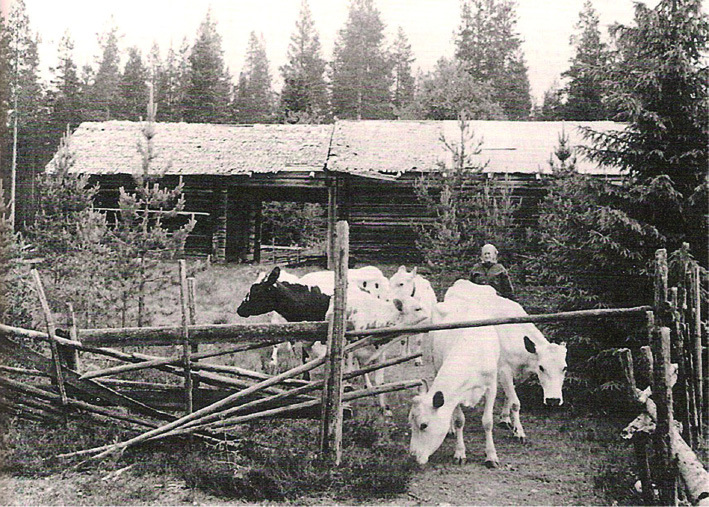 Cattle herding to the forest pasture in Ängersjö 1964. Cattle herding to the common forest pastures would continue a few more years, before the more than thousand years old practice came to an end. Photo Knut Pålsson. Between 1820 and 1920, a number of National land reforms were introduced to Ängersjö (Isacson and Persson 1998; Eriksson-Trenter and Persson 2002). These land reforms coincided with a sharp increase in the economic value of the forests and the subsequent development of the forest industry. Together these events came to radically change the perception and legal status of the forests, from a common multifunctional resource important for subsistence to a private resource with a monetary value (Nilsson et al. 1991). During this process of change, the tension between collective and individual ownership became particularly salient. The first land reform (storskifte) was completed in Ängerjö in 1828. The purpose of the storskifte was to consolidate narrow strips of farming land into larger units. Another purpose was to dissolve the common outfields and transfer them to the individual farms. The storskifte was carried out on a voluntary basis, and the farmers in Ängersjö only shifted the infields. Since the village tax-base in Ängersjö was considered too high in relation to the size of the infields, it was also determined that individual villagers should receive forest land in compensation when the second land reform, the so called delimitation of land holdings (avvittringen), was to be carried out (Eriksson-Trenter and Persson 2002). The purpose of the delimitation of land holdings was to “promote the cultivation and population in the country’s northern provinces” (ibid), but in practice, the aim was to clarify the ownership relations to the forest (i.e. the outland commons). The logic was that if the ownership pattern to the forest was made clear, the farmers’ incentives to improve their lands would increase. It would also create opportunities to establish new farm holdings on what the state considered as “unused” land (the outland commons). Another important task was for the land surveyor to correct the tax rates for the farmers so that the tax was consistent with their possession, not only of arable land, but also the forest (ibid). In Ängersjö, the delimitation of land holdings commenced in 1839 and was conducted by the land surveyor Per Henrik Widmark, the same person who had carried out the first land reform (storskifte). The forest areas that traditionally belonged to Ängersjö were extensive and the farmers would have to pay extra taxes to the state according to Widmark’s calculations. The land surveyor Widmark was, however, not only a surveyor. He was also a businessman who was interested in purchasing forests in the Ängersjö area and later he also became the county governor (Nilsson et al. 1991). In 1853, the farmers in Ängersjö and Widmark reached an agreement whereby Widmark would undertake to pay part of the tax in exchange that he took over large forest areas (Eriksson-Trenter and Persson 2002). In 1859, the delimitation of land holdings was officially established and the same year farmers in Ängersjö signed yet another agreement with Widmark through his shareholding company Marma Forest Ltd. The end result was that the farmers had access to about 25% of the original forest holdings, but they had also collectively negotiated so that they could continue to have shared user rights to all forest resources in the form of hay-making, forest grazing (mulbete), shielings, timber and firewood for household use as well as the right to hunt and fish (ibid). A large part of the forest resources thus continued to be regarded and managed as common resources. In connection with the third land reform process (Laga skifte) that was carried out at the forest company’s request in 1890, disagreements arose over how the previous agreements with the company should be interpreted. The conflict was prolonged, and among other things meant that the prospects for the company to exploit the forest were blocked by the farmers for more than 30 years and that the farmers lost many of their earlier collective users rights to the forest. For many farmers the prolonged conflict became an economic disaster, when the possibility for wage labour for the forestry company also disappeared (Isacson and Persson 1998). The conflict has left a deep impression among the population in the village –and is still spoken of today – in relation to discussions concerning access and ownership to resources. The land reforms and the parallel purchase of large productive forest areas in Ängersjö are, however, not unique. Similar intertwined processes were common in many other places in Northern Sweden during this period. In Sweden, these large scale forest acquisitions have received their own nickname – baggböleri – which is an expression of the dubious economic affairs that the forest companies carried out with the farmers. The Swedish baggböleri, share similarities with today’s ‘land grabbing’ processes that take place in other parts of the world. Similar to the Swedish baggböleri, today’s acquisitions of land resources are justified with arguments of terra nullis (land belonging to no one) and they are often intertwined with unsettled land tenure reforms (c.f. Cotula et al. 2009; De Schutter 2011; Beyene and Sandström 2016). Likewise, today’s large-scale land acquisitions also involves the conversion of small-holder production systems to large-scale commercial use and they occur parallel with that land resources have attained an increased economic value – a process that can be referred to as ‘commodification of nature’ or as a process of ‘accumulation by dispossession’ – where states colludes with capital to seize control of nature and the commons (Harvey 2003; Peluso and Lund 2011). The various land reform processes in Sweden have often been described as a shift from common ownership towards individual ownership. But in Ängersjö as in many other parts of Sweden, the shift of ownership was never fully completed (Sandström 2008). The user rights to the forests and water resources have in many places continued to be held as commons until an individual applied to shift his or her share to private property. Even today in Ängersjö, the majority of the lakes in the parish are regarded as commons, and the right to jointly graze the forests is legally possible even though there are no grazing animals left in the village. Also the collective right to hunt on the company’s land is possible and hunting is still organized by hunting teams of the village. Calculated from the present-day cadastral map about 4% (1647 ha) of the total surface area (39167 ha) of the Ängersjö parish are registered as de juru commons (village roads, fishing waters, old hay-meadows and gravel pits). As a result of the land reforms and the mechanization of agricultural and forestry, the commons based on collective resource use extraction were gradually reduced during the 20th century. Duties related to agriculture and forestry work were handled increasingly by individual family members (Isaksson 2009). In the 1940s, the management of the remaining commons was formalized and transformed into associations that were legally recognized. In 1942 the farmers in Ängersjö established a land owner association (samfällighetsförening) to take care of village roads and the remaining commons (a few gravel pits, common fishing waters and hay meadows). In the following year (1943) a fishing association was formed together with the neighbouring village (Vännsjö). Upon formation the land owners transferred their collective fishing rights to the fishing association (Agreements 1943 Feb). In subsequent years, intensive work began to increase the fish-stock in the lakes around Ängersjö. Similar developments appeared throughout Sweden at this period of time. The Second World War had put Sweden in a state of alert and increased fish yields were regarded as an important national food security issue and the County Administrative Board (CAB) urged all fishing associations in the county to increase their stock of fish (CAB 1943). The Ängersjö fishing association applied for permission and received money to plant out fish and for constructing fish ponds. Over the years, the members of the association have developed an intricate system of rules over who is allowed to fish, when and on what waters. Today the fishing association comprises about 30 members and annually the association appoints fishing officers who are authorized by the CAB to monitor so that no one catch fish illegally. New forms of associational commons were also progressively developed in order to modernize rural life in Ängersjö during the 20th century, on the villagers own initiatives and supported by various institutions. For example, in 1943 the women in the village formed a laundry association and raised money to construct a combined laundry and sauna house on an old common adjacent to the village centre. They gathered once a week, and sewed, crocheted and knitted products, which were sold at social gatherings (Pålsson Undated). They also asked for timber from the forestry company, applied for money from the municipality and arranged dances where the entry fees were donated to the construction (ibid). A few years earlier an intense public debate and awareness campaign concerning the poor standard of hygiene had been going on in Sweden. The national radio broadcasted a series of programs about “dirty Sweden”, which may have prompted the villagers to construct the combined laundry and sauna house. The combined laundry and sauna house was established in 1945 and was used until the 2000s. Other examples of associational commons aimed at modernizing rural life formed in Ängersjö were associations to construct and maintain water and power lines and common food storage facilities in the village. Associations were also developed to strengthen the social cohesion in the village. In the 1920s, the villagers in Ängersjö constructed the so called People’s House (folkets hus), which is both an association and a building, situated at the centre of the village, where the villagers organize meetings and various forms of social activities. A sport association was established in 1932, through which the villagers during a period of 50 years arranged cross-country ski races, ice fishing competitions and football tournaments. The sports association is currently languishing but is still in existence thanks to the management of an important common cultural heritage – a football field. In the early 1970s, there were in Ängerjö parish more than 20 different kinds of local associations in the community. Ängersjö is in this respect not unique but has followed similar patterns of associational development in other parts of the countryside in northern Sweden (Föreningsarkivet 1996). In 1972, in connection with the rural exodus from the Northern part of Sweden, the villagers developed yet another association, the Ängersjö village association (Ängersjö byalag 1972). This village organisation was, however, somewhat different from previous associations. Those who started the association were involved in local development and the association was open to all residents in contrast to the pre-industrial production commons that mainly comprised the landowners (generally the men). Like many other rural associations across Sweden at this time, it was partly formed as a response to the perception that the village had become politically distanced in relation to the municipality fusion process that took place in Sweden between the years 1950–708 but also as a response to the past decades of outmigration from the village (Ekman 2006). The formation of the village association coincided with the closing of the school and a few years earlier the local shop. An archaeological survey was also conducted in the village at this time, which came to influence the work of the association. In a reflection on the early work of the association, the first chairman Folke Pålsson wrote the following: “We missed our history back in time.... We were without history… For the villagers the survey led to the discovery that we had a history older than living memory” (Pålsson, undated). The village association gradually became a key factor in the work to reconstruct local history and on this basis the village association reinforced local identity and mobilized the villagers for the survival of the village. The villagers engaged themselves in projects to restore and search for archaeological sites. They interviewed the elderly in the village about what life was like before and old village records were assembled and studied (Isacson 2009). The future of the closed school building became early a question of symbolic importance for the association and they started to negotiate with the municipality to take over the school building. These negotiations resulted in the municipality keeping the ownership of the building and promising to pay for the maintenance work. The village association paid for electricity and heating. In this way, the school building once again became an important meeting place for the village. The association was also engaged in negotiations with the forest company to establish a nature reserve (10 hectares) adjacent to the village, which was established in 1983. In negotiations with the Swedish public broadcasting and the telecommunication company (SVT and Televerket now Telia Ltd), the villagers were able persuade them to set up a broadcasting mast and a public phone booth (ibid). The association also purchased a cement mixer, a bilge pump, a pool table and two handlooms that were placed in the school premises that could be used freely by the villagers (Ängersjö byalag protocals 1972–1980). Increasingly the members of the village association became involved in activities that explored the village’s history and cultural heritage. Ideas to develop museums in Ängersjö emerged and two committees were created, one for the development of a school museum and one for the establishment of a forest museum. The school museum was established in 1987 and is located on the upper floor of the old school. The history of the forest museum, called Kojbyn (hut village), commenced in the beginning of 1980s, when the village association started to discuss to establish a furnace kiln and to restore an old water slipway that could attract tourists to the area. In 1986 it was decided to locate the museum adjacent to the old slipway and the following year, the first buildings were constructed in relation to a course in traditional building techniques. In 1988 the museum was opened for the public and the village association decided to charge an entrance fee (Isacson 2009). From the late 1980s throughout the 1990s the forest museum expanded stepwise with contributions from a range of funders, and the number of visitors grew. In the 1996s the forest museum was extended with a nature museum and a 300 meter long nature trail (ibid). Today, the forest museum comprises about 25 buildings, all related to forest work from the beginning of the 20th century. Many of them display different kinds of collective management practices from the past, such as e.g. charcoal making, tar and iron production (see Figure 3). The museum provides a representation of Ängersjö in the village heydays when people (particularly the men) worked with forest related activities. Over the years the village association has developed close cooperation with the county museum and the forest company Korsnäs (now Sveaskog), who donated most of the construction timber (ibid). The forestry company has in this way become an important partner for the establishment of the forest museum, which is noteworthy considering the aforementioned lengthy forest conflict between the farmers in Ängersjö and the company at the beginning of the century. Most of the work has been carried out by volunteers, which definitely has reduced costs and strengthened village cohesion. The incomes generated have, however, not been enough for sustaining the operation of the museum. In 1990, more than 3000 visitors visited the museum (ibid) but the numbers of visitors have dropped subsequently and in 2015, the village association decided for the first time not to open the museum, due to lack of people with enough spare time to carry out the largely voluntary work to guide tourists (Länstidningen Östersund 2015). Parallel with the developments of the forest museum, the aforementioned Ängersjö research project was initiated (1998–2002). Through the research project, the history of the village became even more visible, and came to reinvigorate the work at the museum, but also strengthen the villagers’ view of themselves (Ekman 2006). The work with the forest museum in combination with the research project made the villagers even more aware of the village’s past history, and history became in this way an important unifying factor for the village, which both strengthened village identity and gave them a sense of ‘proof’ that the their place was special (ibid). 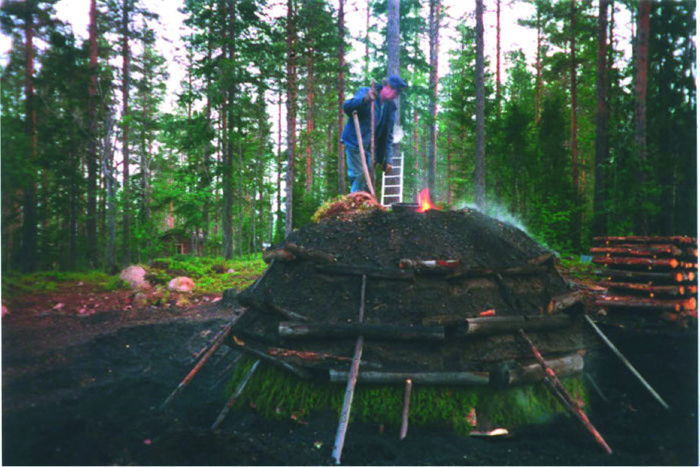 The social practices at the forest museum can be seen as an expression of a flexible approach to traditional local resources (Johansson 2002). It demonstrates an ability in the village to create new resources tailored to the demands of the present, where the reinterpretation and reuse of old resources has been a model for success. Since the 70s, the village has acquired a cultural capital (c.f. Bourdieu 1998) on an expanding national heritage field by engaging in past collective management practices and by acquiring knowledge and contacts at different levels in the society (c.f. Johansson 2002). In this way, the commons have increasingly transformed into important social and cultural resources. Charcoal making at the forest museum. Photo: Bertil Larsson. The processes around the associational commons in Ängersjö (the fishing resource, the school, the laundry house and the forest museum) can be seen as a form of institutional bricolage, in the sense that they are ‘”neither completely new nor completely traditional but rather a dynamic hybrid combining elements of ‘modern’, ‘traditional’, and the ‘formal’ and ‘informal’” (Cleaver 2012, 45), that serve multifunctional purposes. Despite the persistent and rather impressive associational work to develop Ängersjö throughout the years, the population has steadily declined and it has become difficult to sustain all activities and appoint positions to all associations. Closures and mergers have become necessary. Activities connected to the forest museum and the fishing association, however, still engage people and today the people’s house association has merged with the village association. With the depopulation, the responsibilities for the maintenance work of all buildings have also been placed on a declining number of people. All common facilities constitute on the one hand an important social resource but on the other hand, the commons as physical objects also constitutes a problem. These buildings require continuous maintenance and while we stayed in the village some villagers shared their concern to maintain them. Map displaying the spatial correlation between different commons over time. Areas with red colours signify “hot spots” of commons modelled from the archaeological record. The areas marked in red grid are the de juru commons remaining after the land reform. Adapted from Lindholm, 2013. The Öjungsvallen is part of an internal sense of belonging and a social organization that is not immediately accessible to a stranger. Öjungsvallen can be seen as a micro-version of the village, in the sense that Öjungsvallen is divided into smaller ”shielings” which are connected to and named after the old farms in the main village. In that way they are important to the villagers as a link to the past. To own a cottage in Öjungsvallen constitutes a marker of village belonging and signifies that you are “real Ängersjö” (Ekman 2002). Although Öjungsvallen can no longer be regarded as a commons in legal terms, it is talked about and treated like a commons. At Öjungsvallen kinship relationships lie like a ‘web’ over the former shieling area. It is a place where people who live permanently in Ängersjö together with people with strong kin connections to Ängersjö return to spend their summer holidays, thus in a sense, reproducing the custom of moving to the shieling during the summer. At times Öjungsvallen have also been used for church services and Midsummer celebrations. In a previous article Ekman (2002) has argued that the former shieling area can be interpreted as a sacred and symbolic place in the sense that it is associated with repeated patterns of activities, history and myths and thereby contributing to situating shared memories in the landscape and to the construction of village identity. Öjungsvallen is thus an important place for both reproducing internal village relations and for maintaining and developing social relationships with people who have strong ties with the village. The social practices at Öjungsvallen relates to Mary Douglas’s observation (1987) about the way institutions survive if they are able to make analogies. As Douglas understands it, analogies allow institutional arrangements, such as commons, to evolve and persist by correspond to something similar to the particular logic of the institution in question, the point being that in this correspondence the formal structures and practices of a set of social relations appear natural. Another example of a commons with symbolic significance is a 30 km long wooden fence in the forest. According to a story in the village the fence was constructed in relation to a grazing conflict with the neighbouring villages in 1769 (Hälsinglands tidning 1976; Stenvall 1984) to prevent cattle from the bordering villages to enter the land (and vice versa). The fence took considerable time to construct – more than hundred years – and was completed in 1896 (ibid). Given its length and that it was built by hand, the fence represents an impressive construction, where it extends through the vast forest. In 1976, briefly after the village association had begun its local development work, some of the older men in the village started to renovate parts of the old fence and the renovation work lasted several summers until the early 1990s. This is noteworthy, considering that it had past more than 30 years since any cattle grazed the area. Both the fence and the former shieling area of Öjungsvallen can be seen as representations of the past were people continue to engage in commoning processes although they no longer have any ‘real economic’ purpose to fulfil. In a similar way, the village football field, constitutes another important symbolic representation of the village’s identity and past history. The well-groomed football field is still cut regularly even though no sporting events are held. It bears witness to the village’s heyday in the 1930s, when for some time there were talented football players in Ängersjö and when the football team reached success in the national league. The well-groomed football field also signifies that the village is alive. The above examples of commoning processes compliment earlier conceptualizations on how commons evolve and persist. Some commons have endured not primarily because of economic livelihood concerns, but because they carry important meanings for the villagers. The reproductions of these commons are associated with important symbolic values for the villagers and they contribute to the construction of the village’s identity. Mosse (1997) makes a similar point in examining the management of common resources in Tamil Nadu in India. He argues that both symbolic and material interests’ matters in collective action, and that “Tanks, like village temples, are public institutions expressive of social relations, status, prestige and honour”. They are not only physical inputs but also “repositories of symbolic resources” (ibid, 472). In this article we have discerned different forms and historical layers of commons and commoning processes although the distinctions between them are not always clear-cut. One form of commons is those connected to resource extraction connected to the old farms in the village and that have a long historical continuity (e.g. gravel pits, grazing areas, fishing waters and hay meadows). They emanate from the early forest-agrarian society and partially survived the land reforms that took place between 1820 and 1920. The pre-industrial commons can be considered as production commons. They involved labour intense collective resource use practices, such iron smelting, pasture management charcoal and tar production. Another form of commons is the associational commons that were developed under the new economic conditions that emerged during the 20th century aiming at modernizing rural life. They are part of the joint social and economic interests of the village (e.g the laundry house, the people’s house and the village association). A third form of commons are those that can be described as symbolic commons that often revolve around different perceptions of kinship, ownership and belonging over time and that carry important symbolic values for the village (e.g. Öjungsvallen, the fence and the football field). The symbolic commons contribute to the identity of the village, but they are also important symbols of the village’s past history. These different forms of commons are not mutually exclusive, rather they overlap. The associational commons and the productive commons also have symbolic meanings to the villagers and they contribute to shaping village identity. The production commons, the associational commons and the symbolic commons represent different forms of collectiveness. They have different social boundaries against outsiders. The symbolic commons and the production commons tend to revolve around kinship relations mainly maintained by the permanent residents and descendants from the old farms in the village, whereas the associational commons have a more fluid and open membership criteria. The associational commons are organized in more formal ways, in the sense that there is a specific group of people who meet regularly to manage matters of common concerns. The associational commons draws in actors beyond internal village spheres. They activate and engage people from beyond the village, whereas the symbolic commons and the production commons engage persons from internal village spheres, involving mainly the permanent residents and seasonal residents with strong kin ties to Ängersjö (c.f. Ekman 2006). For both the associational commons and the commons of more symbolic character, historical narratives constitute an important resource and an integral part for their creation and survival, but the use of historical narratives varies between them. While the symbolic commons mainly can be seen as representation of the past in which historical narratives play an important role for shaping particular village identities and internal social relations, the associational commons can be seen as commons for driving change. For example, the forest museum is a place where narrations of the forest history are used as a means of local mobilisation, income generation and for showing outsiders what kind of unique place Ängersjö is. The commoning processes at the forest museum is important for the villagers for showing that the village is alive. Our archival and empirical observations of how commons reproduce in Ängersjö lend support to the critical institutional perspective of the embedded and ‘reinvented nature’ of institutional development (Cleaver 2002, 2012; Sandström 2008; Cleaver and de Koning 2015). Several of the commons in this study are embedded in historical allusions from how it used to be before, where people with strong connections to Ängersjö reproduce historical collective resource management practices and adjust them to needs in the present. For example, the construction and running of the forest museum and the seemingly pointless renovation work of the fence can be seen as two illustrative examples of such reinvention processes. By engaging in past management activities and by making analogies to what is perceived as past management traditions, the villagers legitimatize their engagement in the commons, while at the same time they are (re)discovering a shared heritage (c.f Sandström 2008). The assertion of past collective management traditions also connects to broader discourses of heritage management and authenticity found generally in society at the time. For example, the construction of the museum and the collective efforts to renovate the fence emerged at a time when it was popular to develop outdoor museums in Sweden and when subsidies for heritage management were provided by various public institutions and private foundations. The commons were thus strongly shaped by the ability of local actors to link their activities to wider authoritative discourses of for example local heritage and authenticity. Similarly, the combined village laundry and sauna house was constructed in connection to a national public debate and awareness campaign concerning the poor standard of hygiene in Sweden. These processes of interconnections between local agency and broader national authoritative discourses and institutions resemble the concept of bricolage used by Cleaver (2002) and Douglas (1987)10 to show how institutions are formed through processes, where analogies of ‘thought styles’ draw from existing institutions. The contemporary commons discerned in Ängersjö can also be seen as reinvented forms of commons in terms of territorial outreach, dating back to a period before the land reform processes, when farmers formally and informally managed large areas as commons. The commons of today are to a large extent developed and located on, or in the vicinity to these commons (see Figure 4). For example the laundry house is situated on an old village commons, and the same applies the former shieling area of Öjungsvallen, the fence and the forest museum. Also the football field is located in the vicinity of old village commons (Lindholm et al. 2013). In Ängersjö, the commoning processes thus demonstrate long historical continuity that in some cases can be traced back to archaeological time periods. The changing nature of the commons in Ängersjö have in this way developed in relation to both broader authoritative discourses in society and to pre-existing commons, but they have also persisted and co-evolved in opposition to strong and weak policy environments of the state. For example, the villagers resisted the land reforms by trying to make exceptions for the land that was considered as commons. Further when the state was unable to provide basic infrastructural developments to the village at the beginning of the 20th century, the commons became the social space in which villagers organized around. During the 20th century some commons also became formalised and intertwined with state policies that for example aimed at increasing the fish yields or through public support directed towards modernizing rural livelihoods. In Ängersjö, it would thus be misleading to explain the various institutionalization processes around the commons as primarily as struggles between competing individuals that seek to optimize resource use. The commoning processes are better described as a means for developing togetherness while at the same time being important for broader rural development initiatives. The reproduction of the commons can in this light be seen as a continuous process and as a reflection of our time where the commons have co-evolved with changes in society at large. This, however, does not preclude competitions and controversies over resource use in the village. For example in the 1990s a conflict emerged between the people’s house association and the village association. The supporters of the people’s house association wanted to focus on snowmobile tourism, while the village association wanted to focus on developing the forest museum (Ekman 2006). The conflict concerned which image would characterize Ängersjö, forward-looking or history seeking (ibid). This controversy was, thus, not primarily a conflict over how the natural resources should be handled or distributed, but rather a conflict over the image of Ängersjö and a conflict in which projects to invest the relatively few human resources at hand in the village. In ‘modern’ rural peripheral economies, commoning processes may consequently not necessarily be prompted by natural resource scarcity or resource dependence for sustaining rural livelihoods. 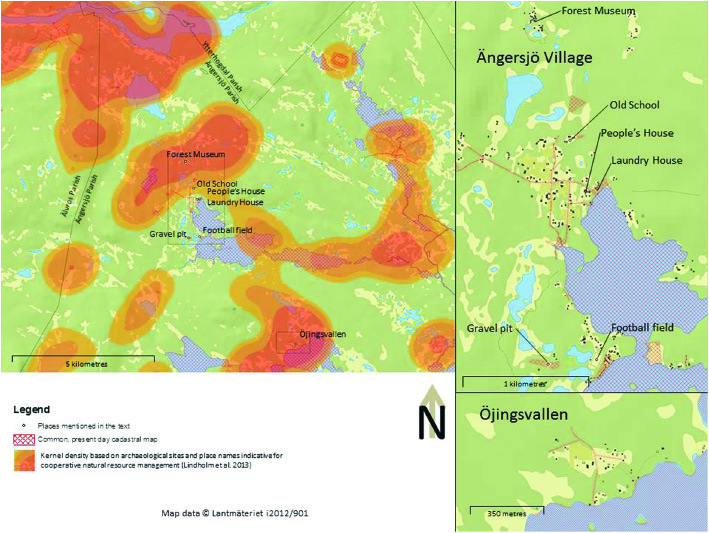 Most people in Ängersjö earn their living from the nearby township (Sveg) and their main sources of income do not any longer accrue from the adjacent natural resources. People are mainly involved in their local commons as part of their spare time activities. In Ängersjö, as in many other peripheral rural economies across Europe, it is people who constitute the ‘scarce resource’ rather than natural resources per se. In a way one might say that the commoning processes in Ängersjö have solved problems associated with labour scarcity, while at the same time being the unifying adhesive that constitutes a community. Such conceptualization of commons and how they evolve and persist compliment earlier suggestions found in the rational choice perspective, where it is suggested that commons are likely to evolve and persist when transaction costs of cooperative behaviour and monitor costs are relatively low in relation to future benefits derived from the resource (c.f. Ostrom 1990, 2000). Although this study has not calculated the transaction costs in relation to future economic benefits, it is reasonable to suggest that transaction costs in relation to the commoning processes in post-industrial Ängersjö have been considerable in relation to the expected economic benefits derived from them. People in Ängerjsö have maintained and developed their commons, although the expected economic benefits derived from them can be assumed to be low. Rather commons of today in Ängersjö, are shaped by discussions on how they are related to preferred ways of life, wellbeing, attachments to place, historical narratives and village identity, that are justified and constructed through various processes of reinvention and bricolage. They have co-evolved in relation to broader changes in society and they have contributed to the continuity and social sustainability in the village. In this study we have highlighted the persisting importance of commons as both symbolic and material sites. The study reveals how the commons have outlasted earlier production systems to serve new purposes in relation to changing social and economic circumstances. The study shows how people in Ängersjö throughout history, have cooperated around commons, and how the functions and meanings of commons have changed over time – from being a primarily important economic resource – to social and associational resources that have created new forms of collective action. The interrelatedness and flexible nature of the commons in Ängersjö has enabled the village to pass through periods of great change. The commons landscape of today in the village owe its continued existence not to fixed or immovable ‘traditions’, but to the constant adaptation of customs to shifting circumstances, constructed on past experiences that have been adapted to needs in the present. Some commons are sites of dynamic environmental, social and economic activity, while others remain marginal, but continue to play an important role as identity markers and for situating shared memories in the landscape. Some of these commons can be seen as symbolic commons and an improved understanding of their symbolic meaning(s) can provide a better understanding how communities function and why some commons endure although the economic returns are at best marginal. The reproduction of the commons in Ängersjö also suggests that commons are central for understanding processes of rural change and the socialization of rural space. Commons are not merely physical sites for resource extraction, and economic activity, but also important ‘sites’ for expressing village identity, social well-being and belonging. In general, the contemporary use of the commons in Ängersjö is characterized by transactions which emphasize networking, negotiations and social belonging of the involved actors. Individuals are resource users but their social practices around the commons are also shaped in relation to village identity which becomes salient in relation to different forms of commoning processes. Commons are in this sense part of the socialization of rural space and the “production of locality” (Appadurai 1996). The commons in Ängersjö have co-evolved with changes in the society and they can be seen as a reflection of different times. Throughout history, the commons have been adapted to suit different needs and conditions of the village. They have evolved in opposition to but also drawing on the resources from a strong state and they have developed in relation to broader discourses and social relationships that have been continuously reproduced. Commons have in this way been important for village continuity and some commons tend to be remarkably resilient, despite recurrent contestation. In our view, research on commons and on how they reproduce can play a central role in future research not just for elucidating issues of resource struggles and dilemmas, but as well for the study of diverse community processes of continuity and change. 1e.g. football fields, hunters lodges, local museums, community buildings. 2e.g. Bromley’s (1991 and 1992) discussion on common property and common property regime. 3Critical Institutionalism (CI) encompasses an eclectic body of literatures (labelled by Cleaver 2012) that partly has emerged as a critique and as a response to theories emphasizing institutional design underpinned by notions of rational choice (e.g. the common pool resource theory). By contrast CI draws on a combination of in-depth ethnographic studies and the longue-durée of history to situate the formation, operation and outcomes of institutions often framed through a lens of political economy/ecology (c.f. Mosse 1997, 2006; Cleaver 2002, 2012; Johnson 2004; Peters 2004; Agrawal 2005; Lund 2006; Sandström 2008; Cleaver and De Koning 2015; Sandström et al. 2016). 4The research project was officially labelled “Flexibility as tradition: Culture and Subsistence in the Boreal Forests of Northern Sweden (1998–2002), involving researchers from social anthropology, archaeology, history, ethnology, human geography and forest vegetation ecology. 6For the debate concerning the formalization of medieval laws, see also Sjöholm (1988,1990). 7In English the word byelaw can be derived from the Swedish/Norse byalag, probably via the spread of Scandinavian culture during the Viking Age (Sandström 2008). 8Between 1950–1970 the number of municipalities in Sweden decreased from about 2500 in 1960 to 390 in 2009 (Ekman 1991). 9The shieling of Öjungsvallen was probably established as a shieling place during the period A.D. 300–700 according to pollen analysis and 14C-dating (Karlsson and Emanuelsson 2002). 10Who in turn draws on Lévi-Strauss’ concept of intellectual bricolage. A special gratitude goes to the informants in Ängersjö for giving their time to discuss and being interviewed and for providing documents for the study. We also thank Louise Fortmann, Linus Karlsson and the two anonymous reviewers for their constructive comments. This paper is part of a larger research projected entitled ‘Commons as Hidden Resources – Analysing the Shifting Roles of the Commons in Rural Development Processes’ supported by the Swedish Research Council for Environment, Agricultural Sciences and Spatial Planning (Formas). Agrawal. Environmentality: Technologies of Government and the Making of Subjects. Durham, NC: Duke University Press. Agreements. Ängersjö fiskevårdsförening, in och utgående skrivelser 1943–1979. Ängersjö Village Archive. Östersund: Föreningsarkivet. Appadurai, A (1996). The Production of Locality. Chapter 9 in Appadurai, A In: Modernity at Large: Cultural Dimensions of Globalization. Minneapolis, London: University of Minnesota Press. Beyene, A and Sandström, E (2016). Emerging Water Frontiers in Large-Scale Land Acquisitions and Implications for Food Security in Africa In: A History of Water, Series 3.Tvedt, T and Oestigaard, T eds. Volume 3Water and Food: From Hunter-gatherers to Global Production in Africa. London: I.B. Tauris. Bollier, D and Helfrich, S eds. (2015). Patterns of Commoning. Amherst, Massachusetts: The Commons Strategies Group, pp. 1–12. Bourdieu, P (1998). Practical Reason: On the Theory of Action. Johnson, R. trans. Redwood City, CA: Stanford University Press. Braudel, F and Wallerstein, E (2009 ). History and the Social Sciences: The Longue Durée. Review (fernand Braudel Center) 32(2): 171–203. Brink, S (2013). The Creation of a Scandinavian Provincial Law: How Was it Done?. Historical Research 86: 432–442. https://doi.org/10.1111/1468-2281.12006. Bromley, D (1991). Environment and Economics: Property Rights and Public Policy. Oxford: Basil Blackwell. Bromley, D (1992). The Commons, Property, and Common-Property Regimes In: Making the Commons Work: Theory, Practice and Policy. Bromley, D. ed. San Francisco: Institute for Contemporary Studies. CAB. Brev till Ängersjö fiskevårdsförening. 16 July 1943. Ängersjö fiskevårdsförening, in och utgående skrivelser 1943–1979. Östersund: Föreningsarkivet. Cleaver, F (2002). Reinventing Institutions: Bricolage and the Social Embeddedness of Natural Resource Management. The European Journal of Development and Change 31: 361–383. https://doi.org/10.1111/1467-7660.00158. Cleaver, F (2012). Development through Bricolage: Rethinking Institutions for Natural Resource Management. London and New York: Routledge, Taylor and Francis Group. Cleaver, F and De Koning, J (2015). Furthering Critical Institutionalism. International Journal of the Commons 9(1): 1–18. https://doi.org/10.18352/ijc.605. Cohen, A. P (1985). The Symbolic Construction of Community. London: Ellis Horwood. https://doi.org/10.4324/9780203323373. Cotula, L, Vermeulen, S, Leonard, R and Keeley, J (2009). Land Grab or Development Opportunity? Agricultural Investment and International Land Deals in Africa. Rome: IIED, FAO, IFAD. De Schutter, O (2011). How Not to Think of Land-Grabbing: Three Critiques of Large-Scale Investments in Farmland. Journal of Peasant Studies 38(2): 249–279. https://doi.org/10.1080/03066150.2011.559008. Douglas, M (1987). How Institutions Think. London: Routledge and Kegan Paul. Ekman, A-K (1991). Community, Carnival and Campaign – Expressions of Belonging in a Swedish Region. Doctoral Dissertation, Stockholm Studies in Social Anthropology, 25.Stockholm: Stockholm University. Ekman, A-K (2002). Med skogen som ram: Om landskapsuppfattning och platstillhörighet. I Johansson, E (red) In: Periferins landskap: Historiska spår och nutida blickfält i svensk glesbygd. Lund: Nordic Academic Press. Ekman, A-K (2006). Skuggbyn – under ytan på en avfolkningsby. Om stratifiering, sociala relationer och överlevnad. Bebyggelsehistorisk tidskrift 51: 67–87. Ekman, A-K (2012). “Det måste flytta hit nå´n mer!” – om minimivillkoren för att upprätthålla ett lokalsamhälle. Bygdeutviklingas paradoks. Bringslid, M. B. and Bente, M eds. Oslo: Scandinavian Academic Press. Ekman, A-K (2013). Överlevnad på gamla strukturers villkor. Norsk Antropologisk Tidsskrift 3–4: 207–220. Eliasson, Y (2013). Ängersjö gårds- och släktbok. Ängersjö: Private publication. Emanuelsson, M, Johansson, E and Ekman, A-K (2008). Peripheral Communities: Crisis, Continuity and Long-term Survival. Reports Deparment of Urban and Rural Development. No 6/2008. Eriksson-Trenter, A and Persson, B (2002). Landskap och juridik: Avvittringen och äganderätten under 1800-talet. Periferins landskap; historiska spår och nutida blickfält i svensk glesbygd. Johansson, E ed. Lund: Nordic Academic Press, pp. 205–234. Föreningsarkivet. Det ekonomiska samarbetets historia; en inventering av ekonomiska föreningar i Jämtlands län 1866–1933. Östersund: Föreningsarkivet. Fournier, V (2013). Commoning: on the Social Organisation of the Commons. M@n@gement 4/2013 16: 433–453. Hardin, G (1968). The Tragedy of the Commons. Science 162: 1243–1248. https://doi.org/10.1126/science.162.3859.1243. Harvey, D (2003). The New Imperialism. Oxford: Oxford University Press. Howell, S and Talle, A eds. (2012). Returns to the Field: Multitemporal Research and Contemporary Anthropology. Bloomington: Indiana University Press. Isacson, M (2009). Byalaget som utvecklingskraft i norrländsk avfolkningsbygd. Bebyggelsehistorisk tidskrift, 57 Tema Landskapets resurser. : 35–51. Johansson, E (2002). Inledning In: Periferins landskap: Historiska spår och nutida blickfält i svensk glesbygd. Johansson ed. : 7–27. Lund: Nordic Academic Press. Johnson, C (2004). Uncommon Ground: The ‘Poverty of History’ in Common Property Discourse. Development and Change 35: 407–434. https://doi.org/10.1111/j.1467-7660.2004.00359.x. Karlsson, H and Emanuelsson, M (2002). Fäbodbrukets långa historia In: Periferins landskap; historiska spår och nutida blickfält i svensk glesbygd. Johansson, E. ed. Lund: Nordic Academic Press. Karlsson, H, Emanuelsson, M and Segerström, U (2010). The History of a Farm–Shieling System in the Central Swedish Forest Region. Vegetation History and Archaeobotany 19: 103–119. https://doi.org/10.1007/s00334-009-0231-9. Länstidningen, Östersund . (2015). Skogsmuseet i Ängersjö tar paus. LT 22 maj 2015, http://www.ltz.se/jamtland/harjedalen/skogsmuseet-i-angersjo-tar-paus, accessed Maj 2015). Lindholm, K-J., Sandström, E. and Ekman, A-K. (2013). The Archeology of the Commons. Journal of Archaeology and Ancient History 10: 3–49. Available at http://urn.kb.se/resolve?urn=urn:nbn:se:uu:diva-211075. Lindholm, K-J and Ljungkvist, J. (2016). The Bear in the Grave – Exploitation of Top Predator and Herbivore Resources in 1st Millennium Sweden – First Trends from a Long Term Research Project. European Journal of Archaeology 19(1): 3–27. https://doi.org/10.1179/1461957115Y.0000000010. Linebaugh, P (2008). The Magna Carta Manifesto: Liberties and Commons for All. Berkley, Los Angeles and London: University of California Press. Lund, C (2006). Twilight Institutions: Public Authority and Local Politics in Africa. Development and Change 37(4): 685–705. https://doi.org/10.1111/j.1467- 7660.2006.00497.x. Mosse, D (1997). The Symbolic Making of a Common Property Resource: History, Ecology and Locality in a Tank-Irrigated Landscape in South India. Development and Change 28(3): 467–504. https://doi.org/10.1111/1467-7660.00051. Mosse, D (2006). Collective Action, Common Property, and Social Capital in South India: An Anthropological Commentary. Economic Development and Cultural Change 54(3): 695–724. https://doi.org/10.1086/500034. Nightingale, A (2011). Beyond Design Principles: Subjectivity, Emotion, and the (Ir)Rational Commons. Society & Natural Resources 24(2): 119–132. https://doi.org/10.1080/08941920903278160. Nilsson, B, Järnankar, F and Pålsson, F (1991). När skogen fick ett värde: En dokumentation av skogsbrukets framväxt i Härjedalen. Sveg: Svenska vyer. Norgaard, R (1994). Development Betrayed – the End of Progress and a Coevolutionary Revision of the Future. London and New York: Routledge. Nyman, A (1963). Den svenska fäboden – ålder, uppkomst, utbredning In: Fäbodar. Lidman, H ed. Stockholm: LT, pp. 15–39. Olwig, K (2013). Globalism and the Enclosure of the Landscape Commons In: Cultural Severance and the Environment. The Ending of Traditional and Customary Practice on Commons and Landscapes Managed in Common. Rotherham, I. D. ed. Environmental Series vol. 2.Dordrecht Heidelberg, New York London: Springer. https://doi.org/10.1007/978-94-007-6159-9_3. Ostrom, E (1990). Governing the Commons: The Evolution of Institutions for Collective Action. Cambridge: Cambridge University Press.. https://doi.org/10.1017/CBO9780511807763. Ostrom, E (2000). Reformulating the Commons. Swiss Political Science Review 6(1): 29–52. https://doi.org/10.1002/j.1662-6370.2000.tb00285.x. Ostrom, E, Dietz, T, Dolsak, N, Stern, P, Stonich, S and Weber, E eds. (2002). The Drama of the Commons. Natural Research Council. Division of Behavioral and Social Sciences and Education.Washington D.C: National Academy Press. Pålsson, F (Undated). Vi har försökt väcka en by till liv, Unpublished. Peluso, N and Lund, C (2011). New Frontiers of Land Control: Introduction. Journal of Peasant Studies 38(4): 667–681. https://doi.org/10.1080/03066150.2011.607692. Peters, P. E (2004). Inequality and Social Conflict Over Land in Africa. Journal of Agrarian Change 23(4): 269–314. https://doi.org/10.1111/j.1471-0366.2004.00080.x. Sandström (2008). Reinventing the Commons – Exploring the Emergence of Local Natural Resource Management Arrangements. Doctoral Dissertation. Acta Universitatis Agriculturae Sueciae 2008:48. Doctoral Thesis. Uppsala: Swedish University of Agricultural Sciences. Sandström, E, Jägerskog, A and Oestigaard, eds, T (2016). Land and Hydropolitics in the Nile River Basin – Challenges and New Investments. London: Earthscan/Routledge. Sjöholm, E (1988). Sveriges medeltidslagar: europeisk rättstradition i politisk omvandling. Stockholm: Institutet för rättshistorisk forskning. Sjöholm, E (1990). Sweden’s Medieval Laws. Eurospean Legal Tradition – Political Change. Scandinavian Journal of History 15(1–2): 65–87. https://doi.org/10.1080/03468759008579190. Steins, N and Edwards, V (1999). Collective Action in Common-Pool Resource Management: The Contribution of a Social Constructivist Perspective to Existing Theory. Society and Natural Resources 12: 539–557. https://doi.org/10.1080/089419299279434. Stenvall, L-G (1984). Sällsamheter i Härjedalen. Stockholm: Rabén & Sjögren i samarbete med Sv. turistfören. Svensson, E (1998). Människor i utmark. [Lund Studies in Medieval Archaeology 21].Lund: Lund University. Ängersjö byalag. Protocols from Ängersjö Village Archive. Östersund: Föreningsarkivet. Ängersjö Village Archive. Undated.Östersund: Föreningsarkivet.